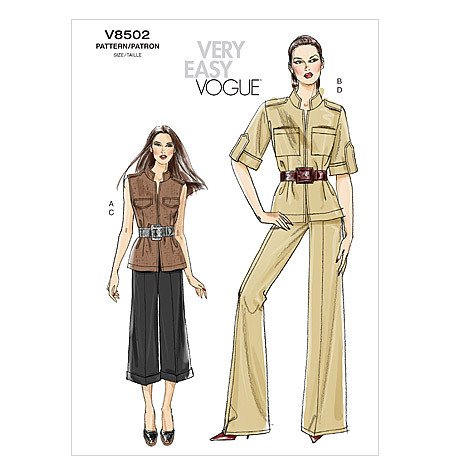 Vogue 8502: Safari or Military style vest and jacket which has front darts, shoulder tabs with snaps, hook and eye front closures and optional purchased belt. A: sleeveless with front flaps. B: cuffed sleeves, sleeve tabs with snaps and front patch pockets. 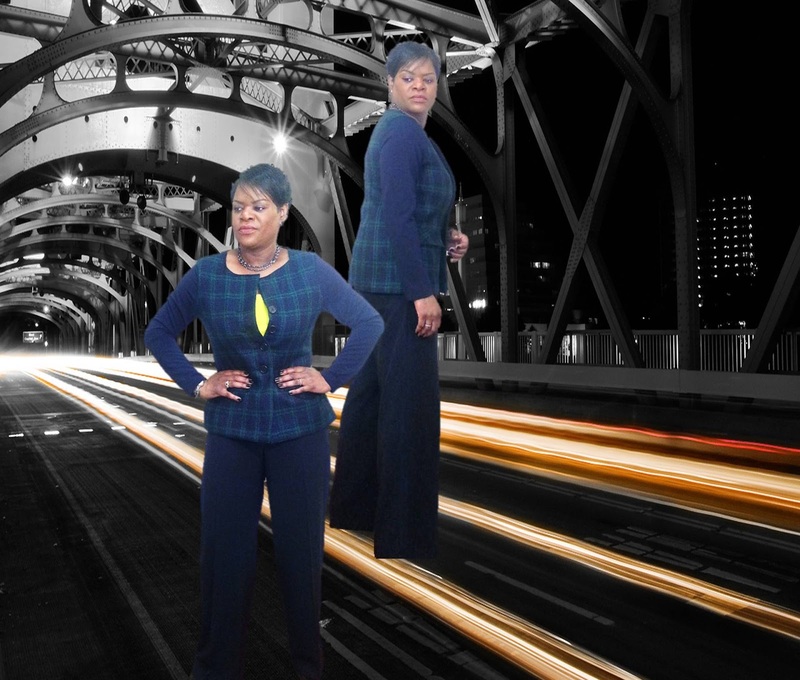 Wide leg pants have raised waist front pleats, back darts and back zipper closure. C: above ankle, cuffed, belt carriers and purchased belt. D: full length with stitched hem. After my last vest project I was on a roll, and V8502 was next in line. I liked the military style of the vest and proceeded with tissue fitting, cutting fabric, marking and basted together. Fabric choice was 1-1/4 yard of green/navy blue plaid fabric, that I'd purchased from Fulton Fabrics last year. The fabric was not densely woven and interfaced all pieces. Construction was easy and basted fronts to back, but once I tried on the vest, the whole military style idea went out the window. The collar was too fiddly, despite the interfacing, the shoulder tabs where akin to exterior shoulder pads and the breast flap gave the illusion of full medal breast plates. After letting a day or so pass, I decided to streamline the garment, removing the collar, shoulder tabs and modified the breast flaps for the waist. As for fit, the only issue I had was too much ease in the back and added waist darts to remove some of the excess. Let me not forget, being that I decided not to use the collar, I lowered the neckline . On the pattern envelope, one can see that the neckline of the jacket is akin to a crew neckline and removed 1/4" from the back and front neckline. The lining was machine stitched at the neckline and front edges and hand stitched the armholes and bottom. For closures, I opted to add buttonholes & buttons. Now the question is how did it go from a vest to a jacket? While making a pit stop in TJ Max, I spotted a young lady with a leather quilted jacket with sleeves that appeared to be double knit. Well an idea was borne, especially being that I didn't have a suitable top to pair with the vest. Friday nite, pulled out navy blue double knit fabric modified the sleeve pattern, and with scissors in hand cut 1/4" around the armholes, serged lining & fabric together. All was not peaches and creme, there was some tweaking of the sleeve to achieve the fitted sleeves. With a few top sleeve patterns and the original jacket sleeve pattern, I was able to trace off a sleeve and get as good a fit as possible. Lastly, I took a deeper hem, the finished length would have been 26" and I prefer my jacket length roughly between 23-1/2" to 24-1/2". It's gorgeous Sheila and I'll bet the knit sleeves are very comfortable. Wow! I like what you did to change this up and the knit sleeve is a nice design idea. I love how you changed this up and made it yours! The double knit sleeves really make this jacket - great job! Good job on transforming this from a vest to a jacket. I love the fabric. What a wonderful jacket! Love the contrasting sleeves. Thank you Ladies. It held up to my 12 hr. wearability test. So its worth another remake and will give me the chance to fine tune the sleeves a bit more. Love the knit sleeves- I like the plaid fabric too. I've been looking for blue/green plaid fabric. May have to check out Fultons. It looks SO good! I am not a fan of breast pockets except on jean jackets. Great job Sheila! Wow so beautiful I love the way you made this pattern your own.